If you have a Francophile on your shopping list this holiday season or perhaps a foodie, be sure to enter TSLL’s giveaway of the above illustrated print from Modvin, Anatomie d’un Repas Français. And if you, yourself, fall into either or both of those categories, be sure to enter to win this French lifestyle inspired print as a stocking stuffer to gift yourself. Perhaps you remember my mention of Lyra Press and their French-inspired illustrations last year on a This & That post. I even have their Les Fruits et Légumes de Saison print framed and in my kitchen. Well, now Lyra Press is Modvin, and the same lovely French-inspired illustrated prints are available and more than a few new ones, including the one above. And the one above can be yours for free. UPDATE: 12/10/17 (1:39 pm – Pacific Time) – thank you to all who entered. The winner has been reached. If you are still interested in the print, but sure to use the promo code available to TSLL readers, TSLL to save 15%. And there is more good news!!! Modvin is offering a promo code exclusive to TSLL readers of 15% off your order with code TSLL. Be sure to check out all of the other French-inspired art prints as well as canvas totes with the illustrations as well. Start shopping here. What a clever– and inspiring! — print! Truly the French have one of the best food cultures in the world. What a treasure– worth emulating. That print would be perfect in my kitchen! I am currently reading L’appart by David Lebovitz. I loved hearing the discussion you had with him on your recent podcast! 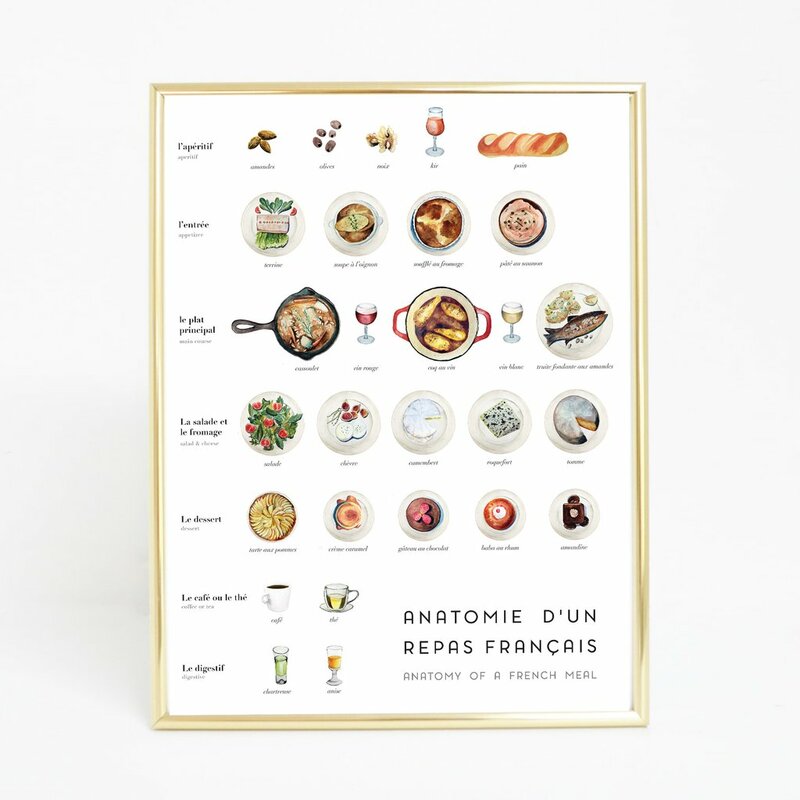 What a great print “Anatomy of a French Meal”. A great addition to any of our kitchens! Thanks for sharing, Shannon!!! How lovely and thoughtful. It would look grand in my kitchen; the perfect spot is waiting for it now! Looks wonderful! I would love that in my kitchen 😊. For chic inspiration and more! Oh my gosh…I would love this for my home! I so enjoy your blog and podcasts. Always informative and interesting topics…love anything French! A classically francais gastronomic print – stunning!! This would be lovely hanging in my cottage kitchen! I have been admiring these prints for a long time! Would love to win this for my kitchen. 🙂 Merci, Shannon! Thanks for hosting this giveaway. I know a Francophile who would love to own it! Lovely !!! Such a great giveaway !!! What beautiful illustrations! It still amazes me how a simple French meal can appear to be so fancy! What a lovely, generous gesture! Afternoon listening to one of your older podcast episodes where you mentioned that these prints I looked them up and asked my boyfriends to purchase the seasonal fruits and veggies print for me as a Christmas gift (beautiful and a practical visual aid)! Would be great to have a pair of these beautiful prints in my kitchen! Thank you for introducing your followers to these clever artists! So many typos! My phone keyboard is on the fritz. Apologies! I too use my seasonal print all of the time to see what to look for in the market. Beautiful items. Bonne chance! Quelle bonne idée! Je l’aime. J’éspère que je le gagne! Joyeux Nöel et Bonne Année! I want to win this so very much! Simple. Luxurious. Life…. How French! I know the perfect person I want to gift this to! Love the giveaway and your blog/podcast! What a great way to think about dining! And the illustrations are so lovely!! I Love the picture. Would really look great in my kitchen. “Anatomy of a French Meal” illustrated by Modvin, would be a wonderful addition to my home. Thanks for the contest Shannon. Hope you have a very Merry Christmas, Shannon! What a wonderful print – I can’t wait to chck out their site, thanks for the link! What a fabulous addition to a kitchen — many thanks for the link and the chance to win one. Joyeux Noelle! I too have been enthralled in the books by David Leibovitz since being introduced to him on your podcast…thank you for such inspiring and entertaining moments! Love it! This would be such a nice addition to any kitchen. What a lovely gift for your readers/listeners. Your blog and podcasts are such a highlight in my day. On days when there are no new ones -I go back and revisit some older ones. There is such a variety I can choose any subject that peaks my interest that day. Such a wonderful prize, which would no doubt inspire creative menu planning. Good luck everyone and Merry Christmas to you and your readers. That would be perfect in my kitchen! Need a little color anyways! Thank you, Shannon, for such a fun, wonderful contest! I’d love to see this lovely print hanging in my French-themed kitchen. Good luck to all entrants! I have just the all waiting to be adorned by this fabulous print! Thank you for the chance to enter! Quelle merveilleuse idée, Shannon! Non seulement pour Hanukah ou Noël, mais pour toute période de l’année! This print would be a great addition to my French classroom! Such a fun giveaway. Thank you. I’m loving their vegetables print too! After an October anniversary trip to Paris, I have become an avowed Francophile. 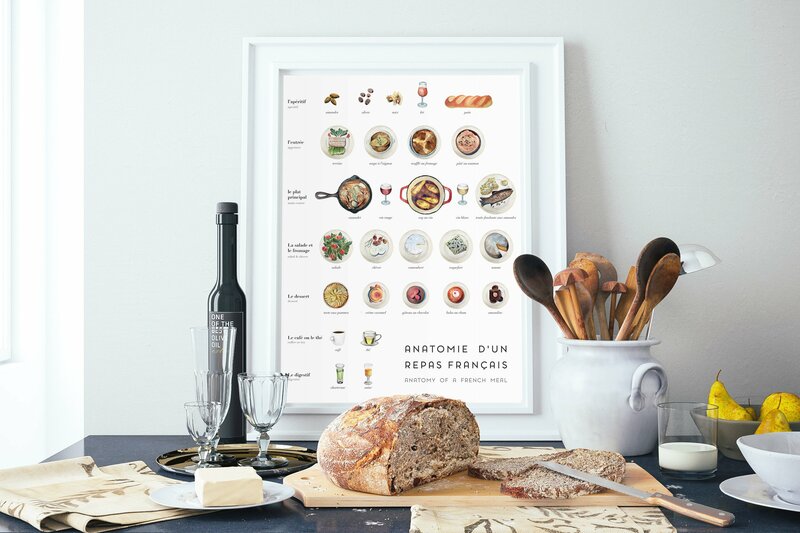 This print will remind me of some wonderful meals we had and inspire me to think “French” when planning dinners. These are amazing. Cute but very classic. How lovely! Just the thing for my kitchen! A perfect gift for one of my coworkers. As a new fan, you have expanded my pleasure in my daily living immeasurably. The print is a beautiful reminder of a Simply luxurious life! J’aime beaucoup! Cette affiche peut être un très bon cadeau pour ma belle-mère. Elle habite à Baltimore. Merry Christmas! This is a great way to celebrate the holiday season! Happy Monday and merci for the giveaway, Shannon. Perfect for the holidays! Perfect for my sister-in-law’s cozy, Vermont kitchen! What a lovely print! I, too, will definitely check out the Modvin website. Thank you for this wonderful giveaway! My son is an aspiring chef and a Francophile; he would love this! Merry Christmas! I would love to have this for my dining room, or for a friend who loves everything French! What a lovely addition to any kitchen! I love this detailed print, thanks for the giveaway! I would love this! I so enjoy your blog, podcast, instagram, twitter etc!! I just found your blog recently, the same time I became single. It is has been a great source of inspiration for me! I would love to hang the print in my new kitchen! It’s a great print and I have a space on my kitchen wall that it would fit in perfectly. BTW, love your podcasts. I do look forward to Monday mornings, you and my espresso (decaf). Wake up to your daily post, great start for a productive day. Love all the feeding you do for my inner francophile! Hope to enjoy Le Repas! I would love this print in my kitchen/dining room. Lovely! (I may be contacted at wellegance@gmail.com) Fingers crossed!! I would absolutely be thrilled to have this print in my home! It would be a lovely reminder of what makes up the glorious French meals that I enjoyed on my trip to the regions of Normandy and Brittany. I have been looking for a way to remind myself, as I design my own meals at home, of the very important courses in the French meal. I’d love to have this as a daily visual cue and a belated souvenir of France! So French, so chic… perfect poster for our petite kitchen in Melbourne, Australia. What a lovely print! I want to make my own french meal tonight. This is such a beautiful picture! Thank you for this opportunity!! What a lovely print! Thank you so mych for the giveaway and Merry Christmas to you! I am a French teacher, foodie, and lover of all things luxurious haha! J’adore Modvin! I just love this print! How perfect for the Francophile! Thank you for the opportunity to win this lovely print. This would be perfect for my kitchen! I love the French meal print! Thanks for sharing the site and the discount code. What a beautiful print! I would love to put that in my french classroom! I love your website. I speaks to the lifestyle I am trying to cultivate. Would love this to decorate my very tiny kitchen =). Oh my goodness this print is EVERYTHING. I’m obsessed! What a lovely print! And so many beautiful products on the Modvin website. Beautiful French art! Thank you for offering it as a give away and Modvin for offering a discount. I always appreciate your your work on the site, thank you! A beautiful gift for someone special ! Merci ! This would look just perfect in my postage stamp size kitchen, above my gas stovetop where my Le Crueset kettle is always on the boil! Je l’aime beaucoup cette “art de repas”! Don’t know if I arrive on time for the conquest but really wanted to try! This would be such a lovely addition to my home! Thank you so much Shannon for doing such a cute giveaway! I love this! Looking at it puts me in the mood for a delicious French inspired meal! It would be perfect for my log cabin mountain home. I would love to have this hanging in the kitchen as a reminder on how to eat. Thanks for opening this competition up to international readers. I am leaving for Paris on Tuesday for a family Christmas and to research. The poster would be a lovely reminder of this delightful experience and contribute to guiding wonderful meals in the new year. I would love a copy of this visual treat. Merci. I’m in the middle of remodeling my kitchen and this print would be awesome in my new kitchen! This would have a place of honor in our tiny but productive kitchen. I’m going to Paris and would love to have this to prepare! Thank you for sharing the book with your friends. And what a lovely idea for a weekly meet up parler française! Such a nice giveaway!! I love it! What a sweet and charming print! It’s lovely! Thank you for presenting this contest. Happy holidays! Thank you for always inspiring elegance! A beautiful print indeed! Thank you for the giveaway opportunity! You enrich lives in so many ways! Pick me! Pick me! Pick me! My sister and I are big Shannon fans. We have conversations as if you are in the room with us. This print is divine. What a charming print! Thank you for sharing it with us, Shannon. What a fun print for my kitchen! I love pretty illustrations, and this poster is just bonus! What a wonderful print, Shannon. Thank you for sharing it with us … and thank you for offering it as a giveaway. It’s perfect for all Francophiles! Joyeux Noël! I love this print and having just updated our kitchen, I now I have the perfect spot for it! Thank you for this fun opportunity! Joyeux Noel! Just the perfect finishing touch to my French-inspired kitchen! Even my sister returned from a 3-month European trip and said my kitchen reminded her of so many homes she had been in. I would love to post this! This print would be gorgeous in my kitchen or as a gift. Thank you for the opportunity to win! The French have the secret to life and gourmet delights for your body, mind and spirit! What a beautiful sweet gesture to all of your readers! Thanks for everything you do – you have no idea the impact you have on peoples lives! I love this! Hoping I win it! A lovely and elegant print! This would make a beautiful gift for my mother’s kitchen. I have just the perfect spot for this in the kitchen. Love your podcast and website. Thank you so much for all you do! What a lovely print. It is perfectly simple. I would love this for my kitchen…. it’s beautiful !!!!!! Oh I adore this print! I have been looking for something like this for my kitchen. How cute to have that hanging in the kitchen! I just love this print! I have the perfect spot for it. I so look forward to your weekly podcast. Thank you so much for sharing. Thank you for offering this giveaway! This would be perfect in my kitchen. This will look gorgeous in my collection of food art. Thank you, Shannon, for the discount code. I ordered the print today. Congrats to your winner! I think you’ll love the print. Enjoy!